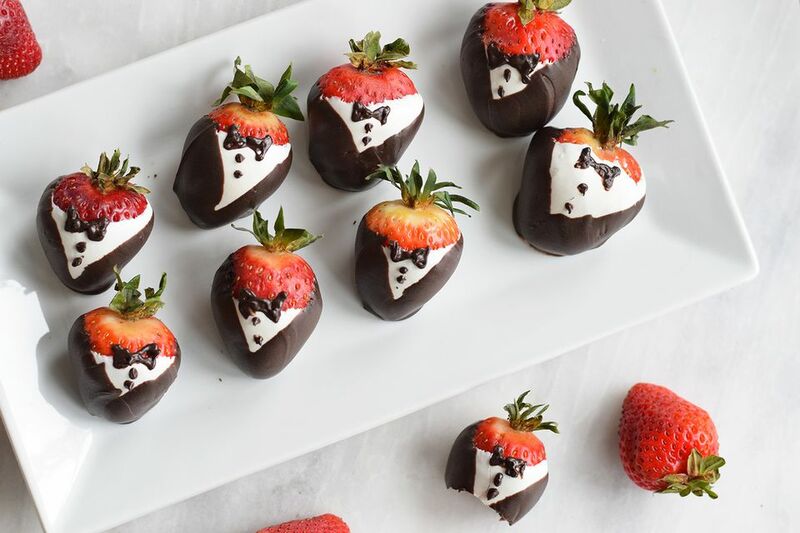 Tuxedo strawberries are beautiful red berries decorated with white and dark chocolate to resemble tiny tuxes. They're the perfect candy for Valentine's Day, weddings, showers, or any formal or romantic occasion. This recipe calls for candy coating, which stays hard at room temperature and gives off a nice shine. You can use real chocolate and white chocolate if you prefer, but it has a tendency to get soft at warm temperatures, so either keep the berries chilled until serving or consider tempering the chocolates. Wash the berries, keeping in mind that it's very important to dry them completely. If they are even a bit wet, the chocolate will not stick to the berries properly. You may want pat them down with a paper towel and allow them to air dry for a few hours on the counter. Next, prepare a baking sheet by lining it with aluminum foil or waxed paper and set aside for now. Melt the white chocolate candy coating in the microwave, stirring after every 30 seconds to prevent overheating. You can use a candy thermometer to exactly measure the temperature. Stir until the chocolate is completely melted and smooth. Dip a strawberry into the white chocolate until it is almost submerged, but leave about 1/2-inch of undipped berry at the top. Allow excess chocolate to drip back into the bowl and scrape the bottom of the berry against the lip of the bowl to remove excess white chocolate that might pool around the bottom of the berry. Place the berry onto the foil-lined baking sheet and repeat with remaining berries until all have been dipped in white chocolate. Place the dipped berries in the refrigerator to set the white chocolate while you prepare the dark chocolate for dipping. Place the dark chocolate candy coating in a microwave-safe bowl and melt it, stirring after every 30 seconds to prevent overheating. Stir until the chocolate is completely melted and smooth. 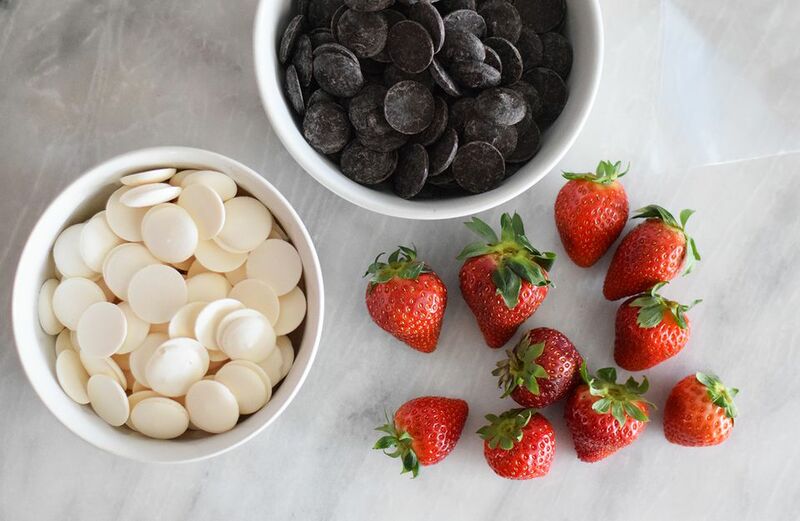 Once the white chocolate is completely set on the berries, take one berry and dip it into the dark chocolate at a 45-degree angle, so that the chocolate covers one side of the berry on the diagonal. Turn the strawberry in the opposite direction and dip the other side on a 45-degree angle. The final result should be a berry that has a white "V" of chocolate showing through a darker outer coating. Allow excess chocolate to drip back into the bowl, and scrape the bottom of the berry against the lip of the bowl to remove excess chocolate that might pool around the bottom of the berry. Dip as quickly as you can so that the warm dark chocolate doesn't melt the white chocolate. Place the berry onto the foil-lined baking sheet and repeat with remaining berries until all have been dipped in dark chocolate. Now it's time to give your berries bow ties and buttons. To draw these on, you can use a piping bag fitted with a small round attachment, a paper cone, or a plastic bag with the corner snipped off. Whichever method you choose, spoon some melted chocolate into your tool of choice. Make a bow tie by drawing two connected triangles at the top of the white V.
Below the chocolate bowties, place two or three dots for buttons, depending on how much room you have. Repeat until all of your strawberries are decorated. Place the tray back in the refrigerator to set the dark chocolate, which should take about 10 minutes, then the Tuxedo Strawberries will be ready to eat. They will keep in the refrigerator for several days, but they are best soon after they are made. If you do want to save them for 2 to 3 days, expect to see some condensation on them as they come to room temperature.